This post is the first in a series originally posted by Neighbors for More Neighbors that will take a deeper dive into the draft Minneapolis 2040 Comprehensive Plan. The city is soliciting feedback on the plan until July 22nd, and it is important that they hear input on the elements that will help support N4MN’s goal of homes for everyone. 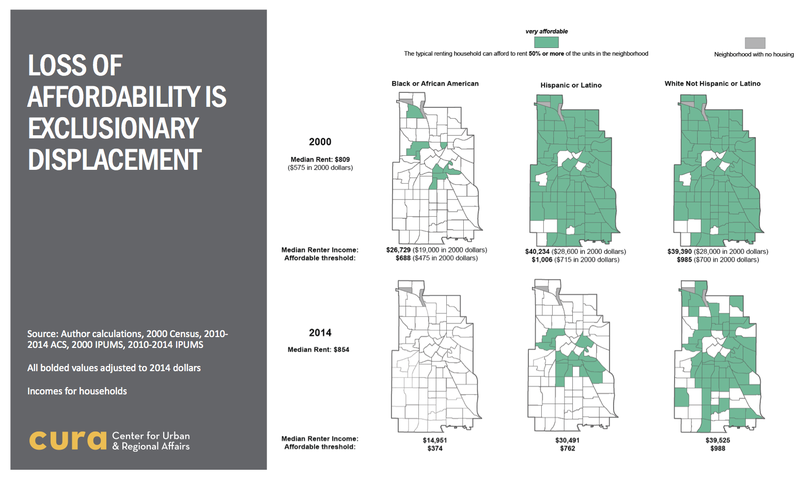 One of the most pressing issues Minneapolis faces today is the loss of 15,000 homes that are affordable. Restrictive land use policies have created a shortage of new homes, driving up housing costs regionally and fueling the displacement of people who can least afford it. Many of today’s zoning and land use policies stem from early 20th century public and private efforts to exclude people from living in Minneapolis neighborhoods with the best access to transit, jobs and amenities. Our current zoning and land use laws were implemented in response to the FHA’s outlawing of redlining and housing discrimination. Sadly they have achieved essentially the same outcomes. The Minneapolis 2040 Comp Plan is an opportunity to dismantle the institutionalized racist, classist, and exclusionary zoning and land use policies in our city. We envision a future where all Minneapolis residents have access to safe and stable homes in neighborhoods of opportunity, where new residents arrive to a city with abundant homes rather than outbidding and displacing existing residents. It’s through this lens that we have reviewed the draft Minneapolis comprehensive plan. Allow housing to be built in all areas of the city, except in Production and Distribution areas. In neighborhood interiors that contain a mix of housing types from single family homes to apartments, allow new housing within that existing range. In neighborhood interiors farthest from downtown that are now primarily single-family homes, increase housing supply and diversity by allowing small-scale residential structures on traditional size city lots with up to four dwelling units, including single family, duplex, 3-unit, 4-unit, and accessory dwelling unit building types. The city intends to allow housing to be built in all parts of town (except in Production and Processing areas), this is a change from current policy that only allows new housing in specific zoning types. This important change will allow for complete neighborhoods city-wide: ones where jobs, transit, grocery stores, entertainment, and other amenities are accessible to more residents, and located within easy trip by foot, wheels or transit. Neighbors for More Neighbors believes we can go one step further, and include housing in Production and Processing areas as well, as long as we clearly recognize the different types of Production and Processing. Locating jobs near housing allows people to have shorter and less costly commutes. High density housing is more environmentally efficient because it is close to jobs, amenities and mass transit networks. Achieving sustainability goals is dependent on building dense housing in our region’s core. Downtown Minneapolis is the largest job center in the state. By building high density housing downtown we allow more people to live closer to where they work. This relieves congestion on our roadways and allows people to live without car ownership expenses. Currently, many parts of downtown are mainly active from 9–5. By adding additional residents, we help downtown neighborhoods thrive and be safely accessible at all times. When we don’t built up we have to build out, which means sprawl. By building downtown, new and expensive infrastructure like roads, sewers, and water aren’t needed because they already exist. Existing wetlands are retained and our region is more environmentally sustainable. Public transit is an important component of sustainability, economic and racial justice, and building cities that are accessible to all residents. Many residents do not drive, cannot afford to drive, or are unable to drive due to age or disability. Public transit ridership continues to increase, with ridership topping 81.9 million rides in 2017. Building dense housing along existing local bus routes will help create demand for high-frequency service and better transit amenities — dedicated lanes, better stop shelters, etc. It also supports the existing investments we’ve made in improving mass transit. Frequency of transit shouldn’t be a factor in the density of adjacent housing. By building dense housing, demand for more reliable and frequent transit is created. Shaded areas presently only allow the construction of new single family homes. In neighborhood interiors farthest from downtown that contain primarily single-family homes, the city is proposing greater housing supply and diversity by allowing small-scale residential structures on traditional size city lots with up to four dwelling units, including single family, duplex, 3-unit, 4-unit, and accessory dwelling unit building types. This includes guidelines that will limit height mostly at 2.5 stories (a limit that already exists in the majority of these neighborhoods). When it comes to existing land use policy, one of the single worst policies is single-family zoning. Single family homes are the only housing option in over 60% of our city. Neighborhoods that were redlined before now see whiter and more affluent neighborhoods; all continued via single family zoning. Single family zoning is tied to a culturally-specific conception of traditional family structures. Not all cultures have the same definitions of family or family size, and single-family zoning in Minneapolis has strict occupancy limits that may not include family as all residents define it. You can bulldoze a small and more affordable home and build a very large and expensive single family home. Providing options to aging residents wanting to downsize, while having the option to stay in their community. In addition to ending single family exclusionary zoning, we would like to see the City develop criteria to evaluate and balance of housing types and ownership/rental models within neighborhoods to better identify local housing needs and ensure housing diversity is available. Allow more housing-by-right in high demand neighborhoods so that projects are not delayed for years. Delaying drives up the cost of new development. Provide more opportunities for public housing, community land trusts, and coops to operate; models which which make ownership available to communities that have been historically disenfranchised from ownership; and models that make rental housing accessible to all residents. Go to: https://minneapolis2040.com/policies/access-to-housing/, and comment on the policy discussed in this post! Send this blog post to 3 friends and ask them to comment on it. Talk to your friends and family members (who live in Minneapolis) about why supporting housing for everyone is important, why the comp plan matters, and how to comment on it. Ryan Johnson is a web developer and linguist from Minneapolis. His free-time is spent on language, folk music and keeping up with politics. People need asphalt, as well as chemical and petroleum products, machinery, vehicles, and more things that fall under the heavy industry umbrella, and might be considered ‘toxic industrial polluters,’ in your terminology. Those industries provide 177,000 jobs in Minnesota; 7% of the total, and 58% of the total manufacturing jobs. The Minneapolis metro area has the highest proportion of pay in manufacturing of any US Metro area over 1 million people. According to BLS, there are 133,000 production jobs in the metro area, with average pay of $19.45 per hour. Compare to $12.61 for food preparation, $15.72 for cleaning and maintenance, and $13.51 for retail sales. The median yearly income for production jobs is $40,000; greater than the median yearly income for white renters in the graphic in the post; a person with such a job could afford to rent nearly anywhere in the city. Another important caveat is that production jobs bring money into the city from outside. While retail and janitorial services are paid for with local money, money from around the US and the world comes into Minneapolis through manufacturing jobs. Housing isn’t the only consideration for economic equality. There must be a large number of jobs that fill the nationwide cleavage that is forming between high paying, white collar jobs, and low paying service jobs. Minneapolis has some of the only middle class urban neighborhoods in the nation, in part because it has that largest relative manufacturing base of any city in the country. Don’t talk down on ‘toxic’ industrial jobs. They are the glue that holds the upper and lower classes together. We need to support the makers in Minneapolis. Without them, Minneapolis will inevitably turn into another Manhattan or San Francisco. It’s just plain ludicrous calling it “environmental racism”. (But I guess just about everything is “racist” somehow today). Haven’t we just had conversations about how all the jobs in the suburbs aren’t accessible to people in the city? Would the neighborhood be better served if all those high paying jobs factory jobs were in Elko and that space was an office tower full of people in suits with college from the suburbs? Is the idea that people in the city still want to use asphalt and petroleum products (whether to fuel their car or pave a bicycle lane) but want to shove the externalities with producing them somewhere else. I recall Northern Metals, which was in the neighborhood probably before probably just about any of the residents in the neighborhood, being kicked out of the city along with all the high paying jobs. So are we going to lament that there’ s no transit service to get city residents from Minneapolis to where the jobs went Becker? I guess recycling is good as long as you can shove the externalities off onto someone else. So “environmental racism” is a very real thing that very real, very respected scholars have been studying at very mainstream, well-known universities and research orgs since the early 1980s. It’s not some new pc buzz-term that someone came up with yesterday, and as someone who’s bothered to get an actual degree in the field it’s insulting to hear you say it isn’t real. Toxic industries are almost always placed in or next to communities of color. The same goes for freeways- which while they may make your commute faster and more pleasant- really actually create concentrated areas of air pollution that seriously damage people’s health. You can argue about whether that’s because land values are lower there, because (especially low-income) people of color have traditionally been politically disenfranchised, or because of racial bias (likely a combination of all three). However, environmental racism has had a real, quantifiable impact on the health and life expectancies of people of color. Yes, jobs are essential but not at the expense of people’s health. Suburbs like Bloomington are built entirely on the idea of shoving the externalities of your choices (whether that’s resource use, freeways and traffic, pollution, run-off, factories, trash incinerators, whatever) off on other people, primarily low-income people of color so it’s a little rich to hear you complain about other people doing it. If you’d like to learn more about environmental racism, the Wikipedia article of all things is actually pretty thorough. Otherwise, you could check out the work of Dr. Robert Bullard at Texas Southern University, who’s considered the grandfather of research and activism in environmental racism. The Interstate System itself is a pretty good example of environmental racism. Wiping out Rondo to build I94 was not just “oh what a good direct route,” it was also about the ease of bulldozing a community of color. So curious – if you look at the interstates like I-35W through tangletown, I-94 by downtown, 394, 35W through northeast minneapolis – are these all examples of environmental racism? Weren’t a number of these predominantly white neighborhoods of various economic levels? Can you see where 35W was routed through the southern part of the city? See where the 35/94 commons are? See where 94 and 394 go? All of those areas were red. Yes, the one part that wasn’t red is 35W north of the river (35W does not go through NE Minneapolis). I-94 near downtown and the commons it would have been difficult to build them anywhere but a red area unless you want the “downtown loop” to be a huge distance from downtown. I-94 north of downtown went where it is because they wanted it to serve the industrial area along the river, not because they saw some red on the map that they could put it through. The original plan until Minneapolis demanded that it be changes went through what were then yellow and blue area. Oh, hey, look, you’re right about 35 south of downtown. My bad. I appreciate this comment and discussion but want to make sure it does not get personal and remains in the spirit of learning from each other about and from different perspectives. Totally fair, Bill. Didn’t mean to make it a personal attack. Monte just writes a lot on here about roadway widening and the like for the use of suburban commuters (and the suburbs in general), and I think it’s important to point out that these things wouldn’t be possible if someone else didn’t bear the brunt of the externalities. Rondo is a good example, but Phillips could be another very current one. We’re currently making a low-income community of color where many people don’t have cars nearly unlivable so that people who commute on 35W and 94 can have an improved freeway with as little short term inconvenience as possible. My complaint isn’t with cities shoving all kinds of externalities on the suburbs. After all that’s part of living in society. It’s that some city residents are doing it while pretending they’re not and maintaining a smug, holier then thou, self righteous attitude. Besides using petroleum products or recycling metal without wanting to deal with the externalities, I’ve previously pointed out all the low value uses right outside the peremitor city. People in the city want to buy new cars or get lumber from Home Depot or groceries from Hyvee without actually having those low value land uses in the city. To say nothing about buying products made in low value industrial parks in the suburbs or shipped from Amazon. The modern city is built on shoving of externalities just as much as the suburbs. As for the garbage burner, I’m assuming most residents of Bloomington would be happy to not have the requirement use it in order to save money on their trash that would go to much cheaper landfills in the suburbs. A Hy-Vee, Home Depot, car dealership, or light industrial park has very different externalities in terms of the impact on people’s health than an incinerator, metal smelting plant, or major freeway. In terms of money, there’s also an inequality in what the city provides vs the suburbs. The whole metro, for example would be significantly less attractive without the U, major hospitals, public housing, or Minneapolis’ parks (all of which city residents disproportionately pay for) than if urban residents had to go to the local Ace Hardware instead of Home Depot (which does generate some tax revenue for suburban cities). And using suburban landfills would create new, equally problematic environmental externalities for all Minnesotans, even those that don’t live nearby. I’m also skeptical that observing that low value land uses are placed on low value land is really observing an externality, although I take the point that city residents use them without having to locate them in the city. This is so wrong, as to be insulting. Your causality is exactly backwards. Industry is built around the railway lines. The railway lines were built a long time ago, the rail links along the river in Northeast Minneapolis were built in 1883, connecting across the Mississippi to St. Paul via the newly built Stone Arch Bridge. In the 1890 census, Minneapolis had 164,738, of whom exactly 1,375 were not white. The Northwest part of town, where the railroad is now and where Northern Metals got chased out of town was in Ward 10 at the time of the census, which is described as “high ground, sparsely settled, with mills along the river. The residents were chiefly Scandanavians of a good class.” The ‘colored’ population of this ward was 0. The railroads got built where they were built. Industry, dependent on the railroad for transportation, could only be built along the railroads. Lo and behold, people don’t want to live near railroads or industry, so houses and rent are lower there. Thus, the poor people move to the toxic industries, due to the affordable housing, not the other way around. Earlier in Minneapolis’s history, it was poor Slavs living near the industry; everyone was ‘white’ and yet some people still had to live near the smokestacks. Now it is poor African-Americans. Despite your racist explanation, housing location has nothing to do with the color of skin, and everything to do with the color green. There is no such thing as environmental racism. Poor people simply get the shaft, like they have at all other times in the history of everything. If people with skin tones that have significance to you are more likely to be living in polluted neighborhoods, it is only because those people are poor. Let me remind you what happened to all those Poles and Bohemians that worked the mills and lived in the bad neighborhoods of the 1890 census. They made decent wages in industry, died early of respiratory conditions and two generations later their kids live in the suburbs. And, mind you, they did this without any sort of Medicaid or Welfare or other programs that hadn’t been invented yet. If you chase all the industrial jobs out of the city, there will be no way out of the low wage trap. The poor will toil in poverty for the forseeable future. Let industry move America’s current poor out of poverty, the way it has done for hundreds of millions before. Well, it was also a matter of redlining. Some couldn’t move elsewhere. A white immigrant might be able to move in a generation, where a non-white could not. Funding for housing absolutely has a history tying it to the color of skin. It’s really a multivariate issue. There’s content upcoming that maps this out relative to Minneapolis. I’ve been saying this a lot, but the removal of restrictive covenants is only one piece. Open plots weren’t re-zoned to allow for other uses. Access to education or jobs didn’t really improve. While for a time, even with money, neighborhoods were closed, the money issue was never minor. Housing access wasn’t the only restriction. Access to jobs and wages paid also were a huge influence. IMO it’s sort of a chicken-and-egg thing. Environmental racism is a term that is useful, but I have noticed that it is not used as much these days as it once was (say back in the 90s). Cause and effect – is it possible that the neighborhoods you covet so much with their clean air benefit from the lower density that is part and parcel with predominantly single family homes, yards trees and he like. By pushing uptown like density and the associated high levels of traffic this will fundamentally change those neighborhoods. Uptown traffic is down considerably over the last decade or so. Hennepin between Lagoon and Lake was at 15,772 AADT in 2015 (most recent count) and 22,061 in 2008 for example. I’d guess housing replacing former industrial uses along the Greenway has reduced pollution in the area too. Housing politics on the north side is almost always heated up to 1000º. I suspect there is a lot of misinformation about how the plan impacts affordability. It’s somewhat strange to see concerns about an influx of investment when attracting it has been a major challenge for years. It is hard to see how demolishing existing housing and replacing it with new expensive housing actually does anything for anyone concerned about affordability. Also, North is right to be concerned about the “TIF” problem. The idea of TIF is that if you build something nice, then land around your shiny new building will get better and blight will go away. Studies have shown the same thing happens with housing. You put up a nice, new, shiny house and the prices of surrounding housing goes up. We need to preserve our existing housing stock first and foremost if we are concerned about affordability, not open it up to being demolished. And to corporate greed. North is upset about this plan. Southwest is upset about this plan. Southeast is upset about this plan. Northeast is upset about this plan. Who supports it any more? I do not view it in that way. I view it as making the code more flexible and allowing it to better reflect the historical diversity of our city, as well meet the existing demographic changes that come with smaller household sizes, an aging population, etc. If we don’t have the growth, then nothing happens. No one is saying don’t grow. The question is HOW to grow. No, it’s where to grow, and some are loudly insisting, not by them. But that’s not what this exchange was about. Jim “we don’t have the growth for the rezoning.” If that’s right, then there’s nothing to worry about because no one is going to build all the new building he’s worried about. MPLS 2040 Plan has NO PUBLIC HOUSING, instead MPHA has plans to privatize all 6000 units of public housing with TIF and public/private financing, replacing it with all section8, but privatized section 8 housing reverts to market rate in 10-20 years. Go ahead and back the new redlining scheme as bankers and developer grab all the public resources and gentrify the city. The density schemes are full of variances, dozens encroach on city park land, more just encroach on neighbors, cutting light access, closer to adjacent homes, dumping underground parking directly onto busy streets or light rail stations. Almost all get granted as we absorb these external costs. Glendale Public housing, 14 acres in hot property Prospect Park, will be torn down and 10-30 floor market rate apt/condos will be built walling in the river, its residents scattered. Sure, 10-20 years of sec 8 will be stuck in one building but say goodbye to low income and hello to Gentrification.